The Find And Replace window is not a dialog box, but actually a tool window. Thus, you can dock it to the side if you find it in your way. Since this window begins in a floating state, it may not be obvious that you can dock it. 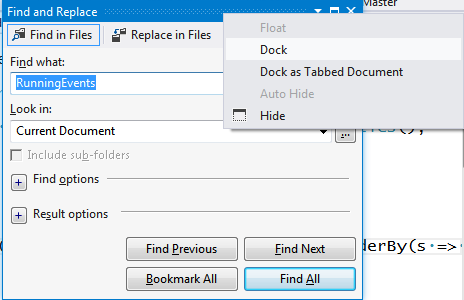 Right-click the tool window title bar and select Dock. Now the tool window can be docked using a docking target. Additionally, you can go to the Window menu and select Dock.